Here's a little piece of heaven that I whipped up once upon a not so long ago. 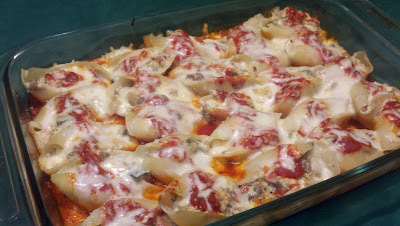 I thought of making stuffed shells, but wanted to do some kind of veggie stuffing. By the time I was finished browsing the fresh produce at the store, I realized my basket was filled with ingredients for a basic ratatouille, so I went with it! The result was DEE LISH!! And the ricotta cheese just pushed it right over the top. SO YUMMY!! I'll definitely be making this one again soon! Peel eggplant and slice into fairly thick slices. Arrange slices on a baking tray in one layer. Sprinkle generously with salt. Let stand for at least 1/2 hour. This will pull all the bitter juices out of the eggplant. Drain. Give the eggplant a super quick rinse under cold water, then pat dry with paper towels. Chop the eggplant, onions, zucchini, and bell pepper into small dice. Add a few glugs of oil to a large saute pan. Add veggies to the pan and saute over medium heat until they slowly begin to soften. Add chopped mushrooms, garlic, and basil. Season with salt and pepper. In a small bowl, combine the ricotta, the egg, and the Parmesan cheese. When the vegetables have cooked down, add the ricotta mixture to the pan and stir until completely combined and creamy. While the veggies are cooking, boil a large pot of salted water. Add the shells to the pot and cook for about 10 minutes, just until al dente. Drain. Now it's time to put it all together. Place about a cup of marinara sauce in the bottom of a 9x13 baking dish. Fill each shell with a heaping tablespoon of the ricotta/veggie mixture and then place it in the dish, making 5 rows of 5. 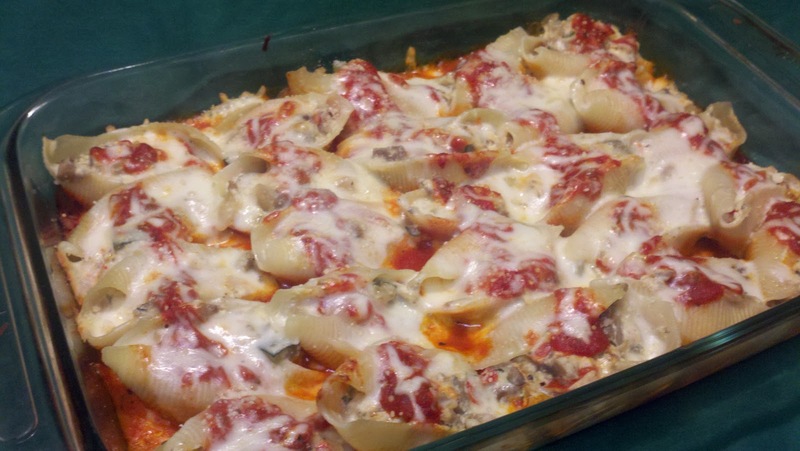 Top each shell with a tablespoon of marinara sauce. Sprinkle a handful or two or shredded mozzarella cheese over all. Cover with foil. Place in a 350F oven for about 30 minutes. Remove foil, sprinkle more Parmesan cheese over the top, and place it back in the oven for 10 more minutes. Let it stand for a few minutes before serving, otherwise you'll burn your tongue. I only do a VERY small amount of the marinara sauce because I don't want it to drown out the flavor of the veggie filling. You just want enough in the bottom of the pan so they won't stick, and you want just a little drizzled over the top of each one so they're not dry. Once again, the amounts of the ingredients are just guidelines. If you like a lot, add a lot! And if any of the veggies is not your thing, then substitute something that is!